Destined to be scrapped in Hokkaido, Japan, the ‘ghost ship’ never reached the scrap yard. Rather, it was set adrift by the tsunami which was caused by the magnitude-9.0 earthquake that struck the country in March 2011. Since then, the vessel has floated on its final voyage across the Pacific. It was spotted a year later, close to the Alaska and Haida Gwaii coastlines. Last Thursday, the 164-foot ship was shot down with cannon fire by the US Coastguard. 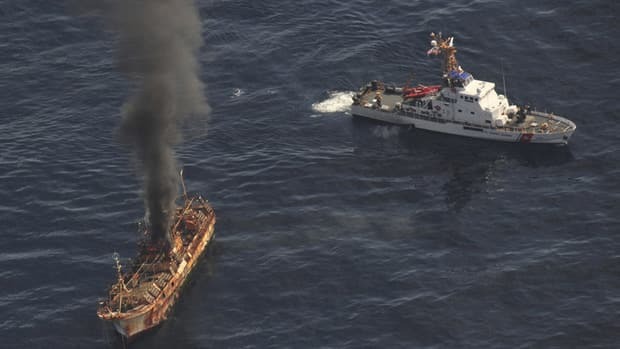 This came shortly after a Canadian fishing vessel, Bernice C, that had claimed rights to salvage the ship in international waters, attempted to tow the vessel. Failing in their efforts, the US Coastguard moved to sink the ship. The ‘ghost ship’ now lies 300 metres below the ocean’s surface in the Pacific Northwest.